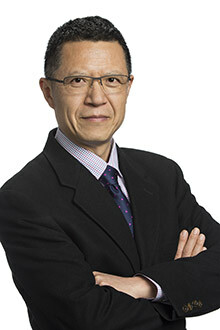 Tao Zha, Samuel Candler Dobbs Professor of Economics, holds a joint appointment with the Federal Reserve Bank of Atlanta, where he serves as executive director of the Center for Quantitative Economic Research. Tao Zha, Samuel Candler Dobbs Professor of Economics, has been named a 2017 Fellow of the Econometric Society, a small group of economic luminaries elected by their peers. Zha is one of 20 fellows named late last year and the first Emory College of Arts and Sciences professor to earn the distinction from the international organization dedicated to advancing economic theory as it relates to statistics and mathematics. Previous fellows include most of the Nobel Laureates in economics, as well as Federal Reserve Chair Janet Yellen, who voted for Zha and others to be inducted. Zha holds a joint appointment with the Federal Reserve Bank of Atlanta, where he serves as executive director of the Center for Quantitative Economic Research. He is also a research associate with the National Bureau of Economic Research. His work has focused on macroeconomics, monetary policy and the broad quantitative methods that provide a framework for more detailed research. The 2011 Nobel Economic Sciences Prize Committee cited his work three times, including one paper on “regime switch” that developed a model showing that changes in the federal funds rate and other U.S. monetary policy changes had not been critical components in the American economy since 1959, including the inflation of the 1970s and the deflation of the 1980s. Zha has co-authored papers with top macroeconomists, including two Nobel Laureates, Thomas Sargent and Christopher Sims. Both Sargent and Sims wrote flattering letters in support of Zha’s appointment as the Samuel Candler Dobbs Professor, considering him to be one of the top macroeconomists in the world, says Hashem Dezhbakhsh, chair of Emory’s Department of Economics. Yet Zha’s scholarly achievements have never come at the expense of his teaching and his mentorship of students at Emory, where he spent three years as co-director of the graduate program and helped to restructure it, Dezhbakhsh says. Zha’s most recent project focuses on China and attempting to understand why Western economists were wrong in projecting that its economy would slow down significantly and that the country would experience a serious economic crisis, if not collapse. The challenge lies in finding enough data in a mostly government-controlled economy, with fragmented information buried in various reports, to assemble a working model. Zha has already taken multiple trips to China to unearth relevant data. He is spending two months there this winter, aiming to construct enough clean and reliable data to build a model that can explain Chinese institutions.